I've been a loyal fan of the re-imagined Battlestar Galactica since the 2003 miniseries, and it just goes from strength to strength. After a very "different" few episodes centred around a planetary settlement and subsequent enemy occupation (which sent the show's focus plummeting down from space), the stories following the inevitable "escape" have been incredibly well constructed. The handling of the different social tensions between groups caught up in different areas of the occupation, and the issues of everyone coming back on board Galactica to the "norm" after a whole year is portrayed so delicately. Starbuck and Apollo have now joined the ranks of characters slowly making the steps they need to make themselves a little more like they used to be: Starbuck cut her hair and got over herself, and Apollo managed to lose all his weight. Then there's the transition of Baltar to life living with the Cylons, giving him more connotations with the original show's human traitor and giving us more insight into the social structure and day-to-day life of the enemy, of which we have seen surprisingly little so far but not really realised it. One of my main gripes about recent events is that the lines between old Boomer and new Sharon were being blurred, and the writers seemed to have semi-forgotten about Baltar's imaginary Number Six when the real deal came back. Couple this with the fact that there are only seven Cylon models anyway and you end up with a whole bunch of confusion. But this was actually addressed by recognising that new Sharon isn't old Boomer and giving her a brand new call sign — none other than the original series' "Athena" — and by Baltar actually making specific dialogue to his imaginary Six as to still not knowing just what the heck she is. Suddenly everything fits in place. 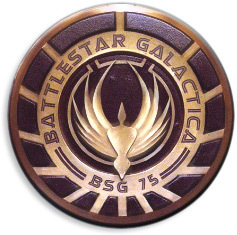 Then, the "problem" that only seven of the supposed twelve Cylon models has ever been seen (something seemingly ignored last week when it was almost implied that only seven models even exist at all) was specifically addressed by adding an explicit air of mystery over the missing five.. and at the same time, tying this into Baltar's own story. Top that all off with a cliffhanger that seems natural but somehow not "obvious", and it has all the makings of an episode which left me wanting to shout "I LOVE BSG" off the rooftops. And I do… hence this post.